Some guests of LOG CABIN RETREAT enjoy nearby hunting and fishing. 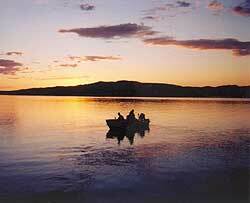 Use your accommodations as a base from which to go out for off-site hunting and/or fishing. Hunting is available through several outfitters and guide companies or individuals. You have several options for hunting. 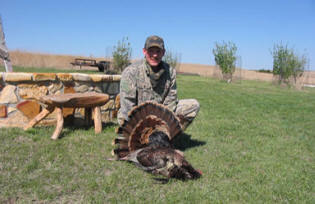 At present we recommend primarily River Bluff Hunting Company of Concordia, Kansas. Hunting through River Bluff Hunting Company can be for you. It is well known that lands open for hunting are becoming more difficult to find. 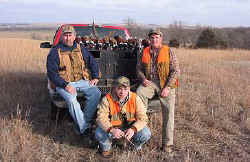 For hunting guides and information about private land hunting, we recommend at this time primarily the folks at River Bluff Hunting Company, 521 West 8th, Concordia, KS 66901, operated by Kirby Buer (785-335-2809, cellphone 316-258-7969), and Kent Buer (785-243-2592), e-mail <buer@riverbluffhunting.com>, website <www.riverbluffhunting.com>. They promote safe and ethical hunting, and they provide private hunting lands ranging from dense woods on the banks of the Republican River to extraordinary rugged and wooded bluffs overlooking the fertile river valley. Beyond these bluffs are rolling pastures with deep draws intermixed with open cropland, with excellent diversity as a key to abundant wildlife populations and trophy qualities of game. The Buer brothers are dedicated to providing high quality hunts, and they specialize in upland birds, waterfowl, whitetail deer, and wild turkey. The Buer brothers are experienced for assisting you in obtaining necessary licenses, equipment, etc. Their offices are located in Concordia (23 miles), but their hunting headquarters are only 6 miles from Elliott’s LOG CABIN RETREAT acreage. Fishing at local and nearby sites. There are numerous fishing sites, locally and nearby. Some of the state’s most popular larger lakes include Waconda Lake less than an hour to the southwest, and Lovewell Reservoir about 30 minutes north near the Nebraska border. For information go to the Kansas Department of Wildlife & Parks website <www.kdwp.state.ks.us/>. Waconda Lake and Glen Elder State Park are in Mitchell County about 50 miles southwest, or 12 miles west of Beloit. The lake has 12,586 acres, and it is one of Kansas’ largest lakes. Glen Elder Lake information; and Glen Elder Park information. The Park headquarters are at 2131 – 180 Road, Glen Elder, KS 67446 (phone 785-545-3345). Numerous recreational opportunities are featured. Glen Elder State Park offers convenient access to the reservoir where crappie, walleye, white bass, saugeye, channel catfish, largemouth bass, and flathead catfish attract anglers. Glen Elder State Park is nationally recognized as the 5th best state park in the United States (source: August 2004 Field and Stream magazine). Swimming, boating, hiking, volleyball, softball, and bicycling facilities are all available. Lovewell Reservoir and the Lovewell State Park are in northern Jewell County, about 30 minutes north near the Nebraska border, or about 21 miles northwest of Courtland. The lake has 2,986 surface acres; Lovewell lake information; Lovewell Park information, and Park headquarters are at Rt. 1, Box 66A, Webber, KS 66970 (phone 785-753-4971). Lovewell State Park is a haven for outdoors lovers looking for variety. It is located off the beaten track and offers an enticing blend of camping, fishing, wildlife watching, and special events.